If you want to stay healthy, you must get this Sole Fitness F80 treadmill so that you can keep up with your exercise regimen anytime you have leisure time. Most people nowadays live in the fast lane, and more and more people get obese because of the lack of exercise. If you don’t want to end up gaining weight, you must have a good exercise routine that you follow. Sometimes, when you are too busy, you tend to forget about a lot of things, and one of those is exercise. The Sole F80 Folding Treadmill has six preset programs of exercise that you can use. If you are still a beginner, you just as well use these programs so you can jumpstart your workout. However, you can also make your own exercise profile with personalized settings. There are two heart conditioning programs as well in addition to the two customizable programs. The 3.0 horsepower motor would surely bring you uninterrupted exercise. It can deliver a speed of up to 12 miles per hour and elevation of up to 15%. Make your exercise more and more challenging by controlling the speed and incline settings. The LED display of the treadmill allows you to see your speed, time, incline, pulse and other exercise metrics. This treadmill has user-friendly features for your convenience and straightforward control of your exercise. There is a heart rate chest strap included for the heart rate control as well as an accessory tray. Walking might be one of the practices that offer more cardiovascular benefits than other activities but walking around on the streets also take its toll on your body especially on your joints. To prevent that from happening, the Sole F80 Treadmill has the Cushion Flex Whisper Deck that reduces the stress on your joints significantly. So, if you are thinking of a good treadmill for home use, this is the one for you. It is also straightforward to store away, you can fold it and Voila! You have saved some space. This is a significant advantage especially if you own a house full of kids or you have a smaller apartment. 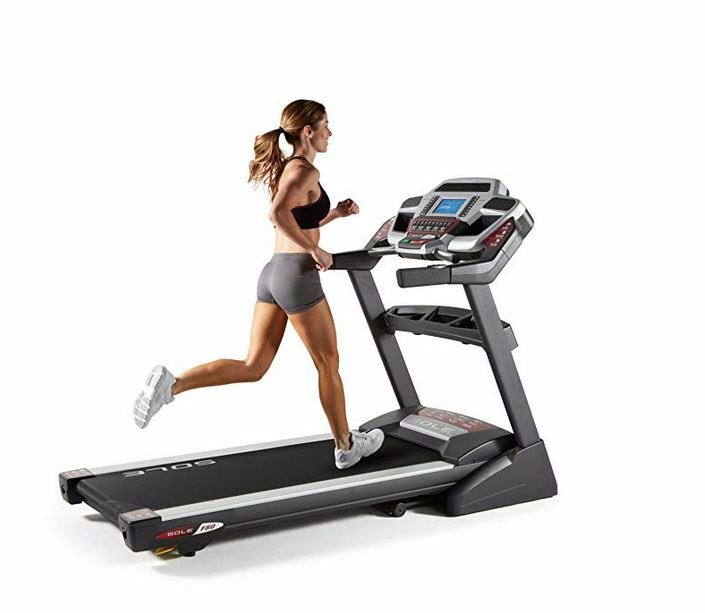 The Sole F80 treadmill is an upgraded version of previous models of SOLE exercise machines. Customers who have used the earlier product, have found the newer one to be significantly better, and they have deemed it one of the best all-around treadmills available in the market. As all treadmills should be, this one fits for family use and is an excellent addition to any self-respecting home’s living room. It varies with motor power, and with each increasing CHP (Continuous Duty Rating), comes a bigger roller and larger in weight. Because so many different sizes are available with the same running surface length, customers have found it useful to be able to select from so many options to perfectly fit their home space. The structure is robust, sturdy and can withstand a lot of weight. The calculations are accurate with no glitches. The Sole Fitness F80 comes with added speakers and fan, which can be considered novel features, but in reality are not as effective as they should be. The speakers are not as loud as one would need them to be, with the fan having lesser power than a typical fan which is needed after workouts. However, the primary functions are still perfectly in check. Here I will compare different Sole treadmills with competing models.